Misinformation. Server errors. Fan backlash. Since EA launched SimCity two weeks ago, the online city-builder has been nothing short of a catastrophe for everyone involved. Much has changed since the game's rocky launch on March 5. Things have gotten better. But all still isn't well, even as EA takes its latest step to make amends with angry fans. 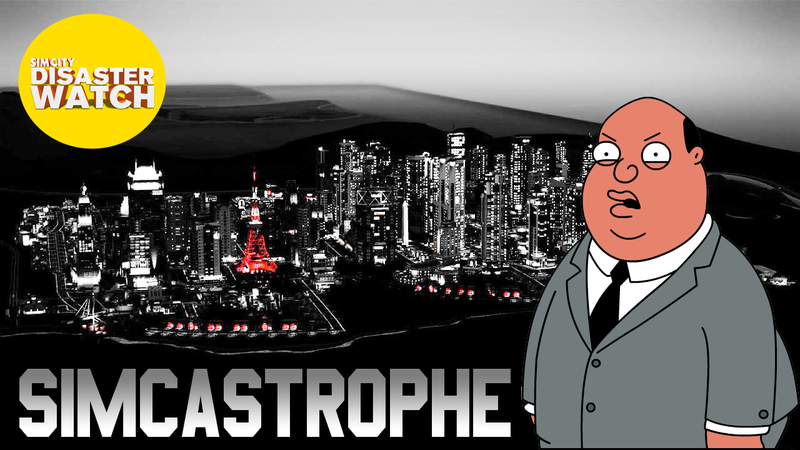 In order to make sure you're caught up, we're zooming out and taking a look back at the whole SimCity Disaster so far. Wondering how things got this way? What's gone right and wrong and right again? Fear not. We're here to explain everything. Okay. I've heard of SimCity, but what's this new one? It's a reboot! SimCity 2013, also known as SimCity 5 or just SimCity, is designed to take the popular simulation series in a new direction. Over the past year or so, the folks at longrunning studio Maxis—now a subsidiary of the massive publisher Electronic Arts—have been making lofty promises for SimCity. It'll come with all sorts of improvements, they said. New transportation options. Population determined by roads. And... an intricate multiplayer network that supports inter-city trading and requires SimCity to be online at all times. That sounds really cool! Why's everyone so angry? Well... for one, you can't play SimCity offline. So your $60 game probably can't be played on, say, an airplane. Or while on duty in Iraq. Or when your router's on the fritz. Or when EA's servers are down. By now you may have heard something about servers being down. OK, I don't get it. What makes SimCity different than other online games? I don't see anyone getting pissed that they can't play World of Warcraft on a boat. That's how Maxis would like you to think of it: "In many ways, we built an MMO," Maxis boss Lucy Bradshaw wrote on EA's website last week. But MMOs justify their connectivity requirement by offering players features that would only be possible in an online game. You can't really look at World of Warcraft and say "oh boy, I wish I could play this by myself!" It takes place in a persistent world where everything you do is connected to everyone else in one way or another. As you walk from area to area, you can see other people interacting with the world, and you can thoroughly grasp why this is a game that needs to be online. In contrast, SimCity lets you sometimes trade with your neighbors. Every city is located in a region, next to a bunch of other cities, and they can interact and connect and help one another to a limited extent, but the majority of your time will be spent, like it is in every SimCity, creating and managing your own metropolis. Play the game for any serious amount of time and it becomes obvious that this is a game that could work well offline. The game is made by Maxis, but everyone's mad at EA. What's the deal there? EA is a very large video game publisher and a lot of people dislike them. EA also owns Maxis. So with a game like SimCity, people refer to the two companies interchangeably. So with so much controversy leading up to release, surely EA must have been prepared for launch day? Surely they must have seen what happened to Diablo III and ensured that their servers worked flawlessly so everyone could play the game when it went live? Ha ha ha. No. On day one, the game didn't work. Day two? Game didn't work. It took almost a week before people could actually play SimCity, and EA had to disable a bunch of features in order to get the game running properly. Maybe you bought SimCity today. So for way too much time, people who spent $60 on SimCity just straight-up couldn't play it. They couldn't play online because the servers were down, and they couldn't play offline because there's no offline mode. Whoops. Did the people at EA/Maxis really not realize that this could happen? Good question. In fact, way back in June of last year, Maxis producer Kip Katserelis assured Kotaku that this sort of thing wouldn't happen. "We've got experience from Spore and Darkspore," Katserelis said. "EA is an online company. We're definitely watching what's going on at Blizzard, and we're putting in backstops and checks to try to prevent those kind of things from happening." Wow, what a bummer. Couldn't they just let people play offline? Creating a connected experience has always been a goal for SimCity, and this design decision has driven our development process for the game. This is easily the most ambitious game in the franchise and we've taken great care to make sure that every line of code embodies the spirit of the series. To do this, we knew we had to make sure we put our heart and souls into the simulation and the team created the most powerful simulation engine in its history, the GlassBox Engine. GlassBox is the engine that drives the entire game — the buildings, the economics, trading, and also the overall simulation that can track data for up to 100,000 individual Sims inside each city. There is a massive amount of computing that goes into all of this, and GlassBox works by attributing portions of the computing to EA servers (the cloud) and some on the player's local computer. Yet... something doesn't seem to add up. Kotaku editor Stephen Totilo found that he could play offline for almost 20 minutes without a problem. There appears to be some sort of code in the game that prevents people from playing offline for more than those 20 minutes. On top of that, Rock Paper Shotgun's John Walker says he spoke to a Maxis source who said that SimCity doesn't require server-side computing at all, and that in fact it could be played offline. "I have no idea why they're claiming otherwise," Walker's source said. "It's possible that Bradshaw misunderstood or was misinformed, but otherwise I'm clueless." So, wait. If it's not necessary, why is the game online-only? Why not offer a single-player mode? We sure think so. But EA isn't saying. We asked them last year, and again two weeks ago, if they made the game online-only as a form of digital rights management. They won't answer. They won't talk about DRM. OK. But won't these sort of crazy restrictions just encourage *more* people to try to pirate the game, even if they wouldn't before? Now I see why everyone was so upset. But by now, the servers must be working. So everything's good with SimCity, right? Not quite. Last week, people started discovering that the game is fundamentally broken in a lot of different ways. For example, Maxis/EA advertised that this SimCity would give every individual Sim his or her own life. That "massive amount of computing" went into SimCity's GlassBox Engine, a "revolutionary simulation technology" according to the game's product listing. Except... fans discovered that GlassBox had some issues. Instead of returning to their own homes, individual Sims would drive into the nearest home available. Instead of driving on empty roads, Sims would take the shortest path available, even if that led straight into congestion. As one EA forum member points out, SimCity's sim-people use the same sort of AI-handling "agent system" that traffic and sewage and power uses. The results are not pretty. The problem is that, just as power can sometimes take a ridiculously long time to fill the entire map (because the "power agents" just randomly move about with no sense) traffic and workers can do the same thing. Workers leave their homes as "people agents." These agents go to the nearest open job, not caring at all where they worked yesterday. They fill the job, and the next worker goes to the next building and fills that job, and so it goes until all the jobs are "filled." So, when you have all your "worker" sims leaving their houses for work in the morning, they all cluster together like some kind of "tourist pack" until they have all been sucked into "jobs." They don't seem to care if the job is Commercial or Industrial, only that it's a job. "Scholars" are handled exactly the same way. As are school busses and mass-transit agents. This is why you see the "trains" of busses roaming through your city, and why entire sections of town may never see a school bus, despite having plenty of stops... Once all the busses are full, they return to school and stay there until school is done for the day. Now, here is where it gets really good... In the evening, when work and school lets out, they all leave and proceed to the absolute closest "open" house. They don't "own" their houses. The "people" you see are actually just mindless agents (much like the utilities agents, as I said earlier) making the whole idea of "being able to follow a 'Sim' through their entire day" utterly POINTLESS!!" Has EA addressed any of this stuff? Sort of. They're aware of all that AI wackiness, and they say they're working on it. Translation: "Online-only is here to stay. Also we sold like a million copies. Deal with it." But is there anything good about the game? Sure. It's a beautiful-looking piece of work. It's got a lot of interesting simulation ideas. The music is great. The sound design is incredible. It's really fun and feels really good to play, at least for the first few hours before you realize how limiting it is to build on such a small plot of land. It's just too bad about all that other stuff. What a disaster. So what's next? If you bought SimCity, you're getting a free game! Well, a free PC game. Published by EA. That's one of these eight choices. And if this whole debacle has left a sour taste in your mouth—and not pleasant sour like a lemon candy, but gross sour like expired milk—rest assured you're not alone. Hopefully, we'll all come away with this experience learning to be far more skeptical of online-only games in the future.